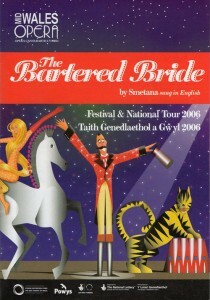 The translation was commissioned and performed by Mid Wales Opera in 2006. Stephen Medcalf’s production was set on the Welsh/English borders. The cast names were changed for this UK interpretation, e.g. Mařenka/Myfanwy, Vašek/Victor, Jenik/Joseph, Kecal/Kettle; the translation works equally well with the original names. and for her husband, he’s just the one. and he is a perfect mother’s son. he has rather proper manners. Well then, won’t he be perfect? Tell me now, what more could you ask?